At the conclusion of work in a geographic region, Minnesota Biological Survey (MBS) ecologists assign a biodiversity significance rank to each survey site. These ranks are used to communicate the statewide native biological diversity significance of each site to natural resource professionals, state and local government officials, and the public. The biodiversity ranks help to guide conservation and management. A site's biodiversity significance rank is based on the presence of rare species populations, the size and condition of native plant communities within the site, and the landscape context of the site (for example, whether the site is isolated in a landscape dominated by cropland or developed land, or whether it is connected or close to other areas with intact native plant communities). "Outstanding" sites contain the best occurrences of the rarest species, the most outstanding examples of the rarest native plant communities, and/or the largest, most ecologically intact or functional landscapes. 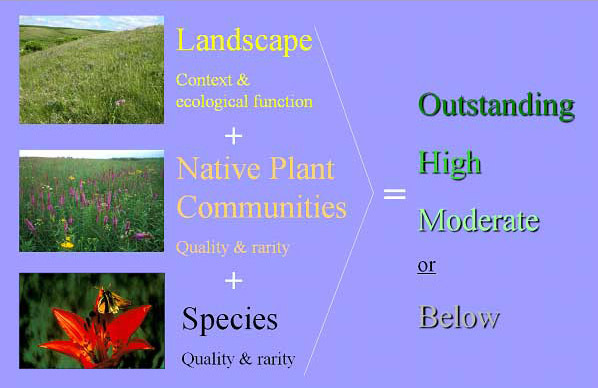 "High" sites contain very good quality occurrences of the rarest species, high-quality examples of rare native plant communities, and/or important functional landscapes. "Moderate" sites contain occurrences of rare species, moderately disturbed native plant communities, and/or landscapes that have strong potential for recovery of native plant communities and characteristic ecological processes. "Below" sites lack occurrences of rare species and natural features or do not meet MBS standards for outstanding, high, or moderate rank. These sites may include areas of conservation value at the local level, such as habitat for native plants and animals, corridors for animal movement, buffers surrounding higher-quality natural areas, areas with high potential for restoration of native habitat, or open space. 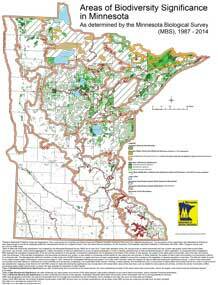 This map displays areas of biodiversity significance in Minnesota, including sites across the state that have been determined by the Minnesota Biological Survey (MBS) to have outstanding, high, or moderate biodiversity significance according to the criteria described above, and several large wilderness or protected areas in the northern part of the state. Sites of biodiversity significance mapped by MBS may contain high-quality native plant communities, rare plants, rare animals, and/or animal aggregations. Initially, the boundaries of these sites are determined by review of aerial photography to identify potential areas of native biodiversity based on native vegetation. In subsequent field investigations, MBS assesses the ecological characteristics of the site and the presence of rare species. Following field investigations, site boundaries sometimes are revised, or sites added, to incorporate critical habitat for rare plants and rare animals. In these instances, the quality of native plant communities is not the primary criterion for ranking the site. The data on the map generally reflect the condition of sites at the time of MBS fieldwork in a region and have not been systematically updated to account for changes to the vegetation or species populations since then. The data are oldest for parts of the western prairie region of Minnesota, where surveys began in 1987, followed by southeastern Minnesota and eastern Twin Cities metro counties. Surveys are still underway in the northern part of the state. Areas not mapped as sites of statewide biodiversity significance include: 1) lands where native plant communities have been altered or destroyed by human activities such as farming, overgrazing, non-sustainable timber harvest, draining, invasive species, and development; and 2) occurrences of native plant communities that are too small to meet minimum size standards for mapping. Areas that do not meet MBS criteria for statewide biodiversity significance may include lands with conservation value at the local level, such as habitat for native plants and animals, corridors for animal movements, buffers surrounding higher quality natural areas, or areas with high potential for restoration of native habitat.